When considering bird watching accessories a tripod may not seem important. Birds are constantly on the move and a tripod is a fairly stable device. However, there are times when it is a valuable tool. Using a tripod can improve vision. No matter how powerful your binoculars are, the image is limited by the steadiness of your hands. In order to work properly our muscles are constantly making adjustments that we do not notice. These adjustments, however, send tiny vibrations through binoculars which affect the image you see. Using a tripod eliminates these vibrations, especially over long periods of bird watching. A tripod may not be convenient when following a bird through trees, or across a field. It is essential, however, when watching a nest or staking out an area that a particular bird routinely visits. This type of bird watching requires long stretches of time staying as still as possible in one place. A tripod allows you to set up your binoculars in the best position and watch for a longer time without tiring your arms, hands, and wrists. The bird watching tripod should be light, strong, stable, and easy to set up. The head needs to move easily, allowing you to follow birds, and lock and unlock quickly as you spot the bird you are watching for. It should also be a comfortable height for you to use. Naturally, this varies from person to person based on height and how each person prefers to stand. Field Optics Research has tripods made of a feather-weight spun-fiber that is stronger than steel. They are durable and easy to carry, and can improve the image you see while reducing fatigue. 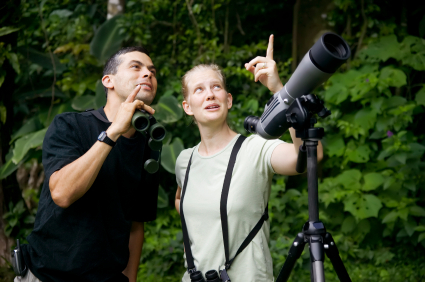 Use a tripod from Field Optics Research make bird watching more enjoyable.